I developed this recipe on my own and we loved it!! And of course it was super easy. I have made it several times since. I made this in my 6 quart slow cooker. (1) In a sauce pan melt the butter and add the brown sugar. Let the caramel sauce cook 2 minutes or so over medium high heat just before the sauce begins to bubble. Add and mix-in the drained pineapple tidbits and cook for another minute to coat the pineapple pieces. (2) Dump the caramel-pineapple sauce into the crock pot. (3) Prepare the cake mix as directed on the box. 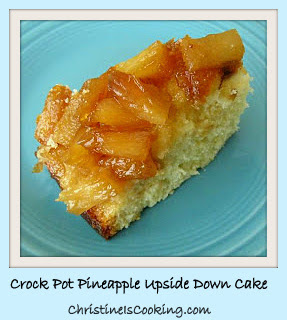 Pour the cake mix evenly over the caramel pineapple sauce. (4) Cook on high for 2 hours or until the cake is fully cooked, but still moist. (5) Invert the cake and gently dump it onto your serving platter. Will the same cooking time apply for the larger oval shape crockpots? Thanks. That is exactly what I cooked mine in... a 6 qt. oval large crock pot. Hi Zee. I believe it was the duncan hines brand and there was only one size available. It should work with any brand of pound cake mix though if you cannot find that one. Thanks!